Willa has been working on a new photo exhibition during the past few months which will be on display at the event. There will be food, drink and plenty of fun and games, in addition to an awesome line up of local music. More than a dozen bands are scheduled to play, including Jeffro, Sad Magazine, Milagro Saints, Molly Sue Gonzalez and the Mean Mean Men, Road Trip and the Johnny Folsom Four. 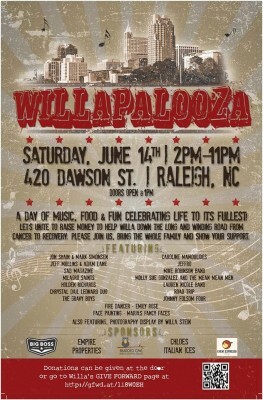 This music extravaganza takes place this Saturday, June 14, from 2:00 to 11:00 pm at 420 S. Dawson St. in downtown Raleigh. WILLAPALOOZA is open to the public, and there is no set ticket price; we ask only that you register and offer a donation of any size at the door. You can register for the event on the WILLAPALOOZA website, facebook page, or contact event organizer Lori Harris. 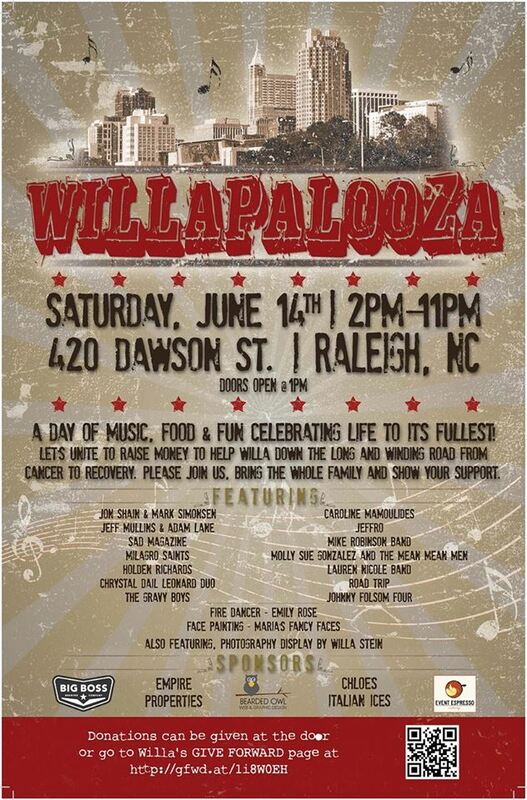 WILLAPALOOZA is being hosted by David Burney, Kim Andersen, Molly Schmidt Doll, and Greg Mosorjak, among other Raleigh notables. Big Boss, Empire Eats, Bearded Owl, Chloe’s Italian Ices and Event Espresso are the sponsors. I was excited to see such an event as my dog is named WILLA and it was nice to see the funds go to such a wonderful cause… I was wondering if you were selling tshirts for the event. I live in Massachusetts and would gladly order one. no T shirts but go to the facebook page and you can make a donation if you can or like to. Thanks.